I decided to go for something completely different for this month's No Croutons Required. I asked for soups and salads containing coconut. I quite often add coconut milk to my spicy soups, but I wanted to see how you would add it. CO YO yoghurt, a yogurt made from the milk of the coconut and not from dairy milk. Well, if the winner is from the UK that is. If they are from outside the UK, I will send them a wee prize myself and pick another UK winner. No voting poll this month, just my favourite. I will announce the winner at the end of the post. Akheela went for something completely different. A sort of savoury porridge soup made with rice. I don't know what half the ingredients are, but that doesn't stop me from wanting to dip a spoon in and slurp some up. 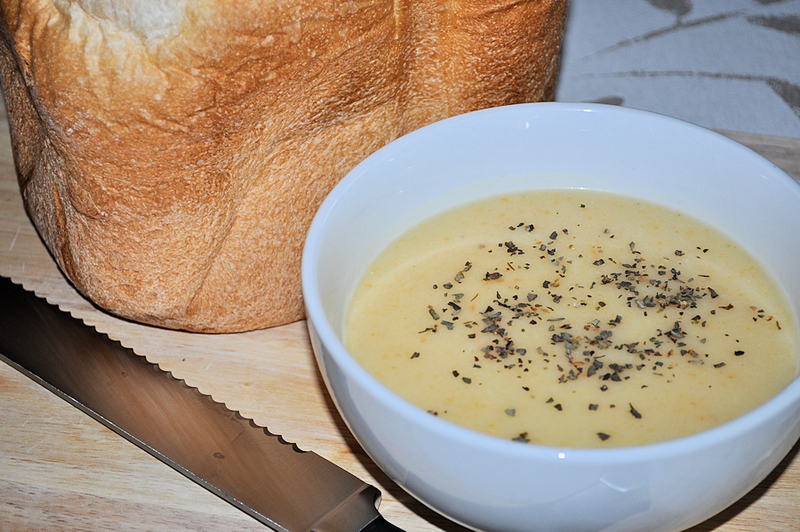 Janet likes to indulge her guests and sometimes a luxurious bowl of soup can do that. Here is what she has to say about this delicious concoction. 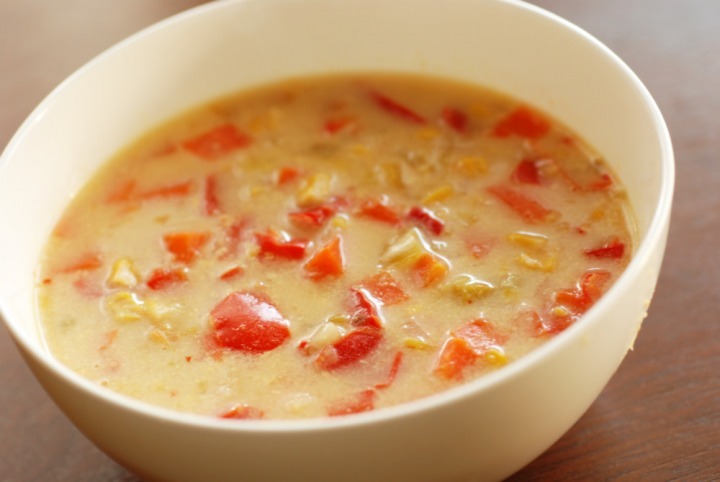 A creamy coconut-based soup filled with chickpeas, red peppers with a dash of heat from chiles. Sweet from the peppers, creamy from the coconut milk and creamed corn, heat from the chilies and bulk from the chickpeas. Sally is a bit like me, she is always trying to find new ways to tempt her children with spinach. You have to head over to The Recipe Junkie and find out about the mint choc chip mash, you really must! This one is an easy way to tempt the whole family. Onion, garlic, chilli, spinach, vegetable stock and coconut milk. Fabulous! Doesn't that look an amazing pot of soup? As Johanna says it looks quite soupy, but some time out to put wee Sylvia to bed and she can back to a thick soup you could actually stand a spoon up in. Lovely! Quinoa, onion, carrot, red capsicum, garlic, curry powder, cumin, mustard powder, chilli paste, vegetable stock, coconut milk, chickpeas, brown lentils, tomatoes, black kale, baby spinach and seasoning. Another mum trying to tempt her children with nutritious meals. This one got the thumbs up, even from the little one, who can be a bit fussy. Onion, potatoes, leeks, lime, stock, coconut milk, ginger, basil and seasoning. I think I would love this one too Lesley. I am always excited to see a new quinoa dish, as it is so good for you. Named a superfood, it earns it's name as it is very high in nutrients. 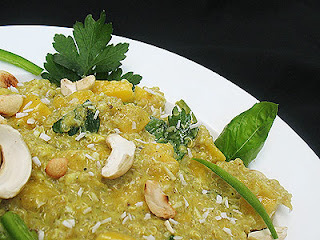 This dish is "thick and rather creamy and served chilled with fresh mangoes and a refreshing Thai green curry dressing. Bursting with fresh flavors complimenting the goodness of nutty quinoa, here this popular gluten-free grain is simmered in coconut milk to bring out even more flare in this dish". Lisa even made her own vegetarian Thai Green Curry Paste and it sounds delish! Curry Leaf talks about sambal oelek, which she had added to a salad dressing and this time added to a pasta salad. I was in the dark, so I had to google it. Sambal is a chilli sauce and oelek is the stoneware it is made in, a sort of stone pestle. Back to the salad. Spaghetti, broccoli, carrot, bean sprouts, coconut milk, soy sauce and sambal oelek. I decided to go sweet with my salad and produced some dessert. 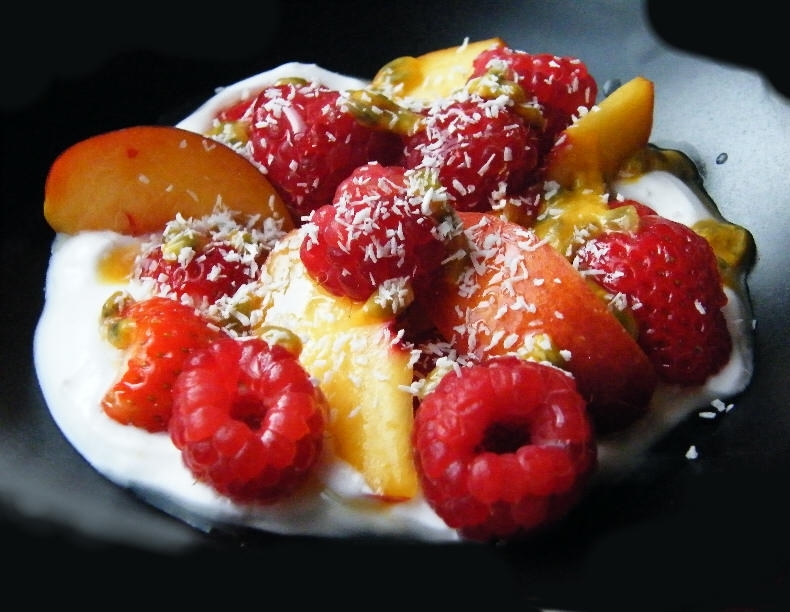 Ripe Summer fruit nestled onto a bed of coconut yoghurt and finished with a drizzle of honey and a sprinkle of dessicated coconut. And..... even better, it comes in at only 174 calories. Great for my fast days. I was immediately intrigued by Stuart's chocolate balsamic dressing. We all know that balsamic vinegar perks up strawberries a treat, but adding it to chocolate? 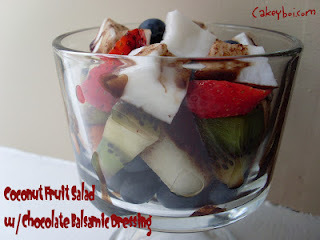 Strawberries, kiwi, grapes, cantaloupe, honeydew melon, blueberries and coconut chunks, mixed together and finished with a drizzle of that sticky sweet dressing. I have to try it, it's inspired! 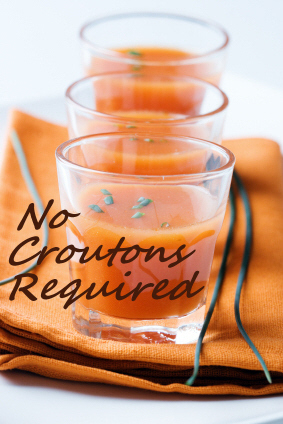 So that is it for this month's No Croutons Required. A short, but sweet roundup with some really interesting dishes. I hope you enjoyed them and will visit a few of the blogs. As I am judging this month, I decided to go with the recipe I wanted to eat right away and although I was tempted by the other dishes, it had to be Johanna's African Curried Coconut Soup. So a winner's badge and a wee prezzie winging it's way to Australia, but who to pick as the UK winner. It would almost be easier if there were more to choose from. I hummed and hawed as I moved between them, but in the end I decided I was so excited by Stuart's sticky chocolate and balsamic glaze, that I had to give the prize to him. Congratulations to Johanna and Stuart! For next month's NCR challenge, head over to Lisa's Kitchen at the beginning of September. I rather like the sound of Lisa's Thai Coconut Mango Quinoa Salad and I'll head on over there and give it a go. As for getting kids to eat spinach, I'm surprised anyone has a problem -- with boys anyway. Dad used to persuade my nephew to eat all sorts of veggies when he was young by persuading him that they were spinach and so would give him muscles like Popeye's. Thank you so much Jac - I am looking forward to my prize!! The African Curried Coconut Soup looks fantastic. I'm off to check out the recipe! It is definitely a worthy winner! Eh, I'm a bit disappointed in myself because I made a spinach, nectarine and coconut salad at my parent's house, but did anyone have a camera? No, they did not. And we didn't make it again in time to photograph. But, it turned out to be really fresh and delicious. I'm having a really wonderful time with all of the soft fruit available, and while sure, we COULD have used tomatoes, we can do that anytime. We've only got these fabulous nectarines right now! The coconut we used was unsweetened, because the vinaigrette was sharp and citrussy and a bit on the sweet side as well. I sprinkled flax seeds on the top for an extra bit of crunch and nutrition. I think it's low-cal enough to make your 5:2 list! I'm going to try that quinoa as well - it's the last thing I would have thought to put with coconut!